The FBI and several United States congressional committees have been investigating links between Russian officials and individuals associated with Donald Trump, the current President of the United States, when he was a candidate for the office as part of their investigations of Russian interference in the 2016 United States elections. Some of Trump's campaign members, business partners, administration nominees, and family members have been subjected to intense scrutiny following intelligence reports on such Russian interference. The investigations have revealed that a number of them had various types of links to or contacts with Russian officials, business people, banks and Russian intelligence agencies. Several investigations are underway to determine whether Trump or any of his associates have had improper dealings during their contacts with Russian officials. FBI investigations began in late July 2016 and are ongoing. In May 2017, former FBI Director Robert Mueller was appointed as special counsel in the FBI's investigation. The Senate Intelligence Committee and the House Intelligence Committee are also conducting inquiries. In May 2017, Glenn A. Fine, the acting Defense Department Inspector General, confirmed he was investigating Michael Flynn for misleading Pentagon investigators about his income from companies in Russia and contacts with officials there when he applied for a renewal of his top-secret security clearance. In October 2017, Paul Manafort and Rick Gates were indicted and arrested. Flynn and George Papadopoulos pleaded guilty to lying to the FBI during the Russia investigation. The New York Times reported on February 14, 2017, that phone records and communications intercepts showed that Trump associates—including members of the Trump campaign—had "repeated contacts" with senior Russian intelligence officials during the 2016 campaign. Paul Manafort was the only Trump associate who was specifically identified as participating in these communications. CNN reported on March 23, 2017, that the FBI was examining "human intelligence, travel, business and phone records and accounts of in-person meetings" indicating that Trump associates may have coordinated with "suspected Russian operatives" to release damaging information about the Hillary Clinton campaign. CNN reported on September 19, 2017, that Manafort had been a target of a FISA wiretap both before and after the 2016 election—beginning sometime after he became the subject of an FBI investigation in 2014—and extending into early 2017. Some of the intercepted communications raised concerns among investigators that Manafort had solicited assistance from Russians for the campaign, although the evidence was reportedly inconclusive. On April 30, 2018, The New York Times published a list of interview questions for Trump that the Mueller investigation had provided to the president's attorneys. Among the questions was, "What knowledge did you have of any outreach by your campaign, including by Paul Manafort, to Russia about potential assistance to the campaign?" On March 22, 2019, the special counsel concluded their investigation and submitted their final report. On March 24, 2019, Attorney General William Barr sent a four-page letter summarizing the final report to the heads and ranking members of the Senate and House Judiciary Committees which explained that Mueller "did not find that the Trump campaign or anyone associated with it conspired or coordinated with Russia to influence the 2016 U.S. presidential election." For many years, there has been intensive public scrutiny of Trump's relationship to Russia. In a book excerpt published in Politico, former Guardian Russia correspondent Luke Harding stated that files declassified in 2016 indicated that Czech spies closely followed Trump and then-wife Ivana Trump in Manhattan and during trips to Czechoslovakia in the time after their marriage in 1977. Natalia and Irina Dubinin, daughters of then-Soviet ambassador Yuri Dubinin, are cited as indicating that a seemingly chance meeting of their father with Trump in the autumn of 1986, was part of Dubinin's assignment to establish contact with America's business elite and a determined effort by the Soviet government to cultivate Trump in particular. This effort extended through a series of subsequent events, also documented in Donald Trump's book The Art of the Deal, including a meeting in 1986 between the Ambassador and Trump at Trump Tower and Dubinin's subsequent invitation to Trump to visit Moscow (which was handled via KGB-affiliated Intourist and the future Russian Permanent Representative to the United Nations Vitaly Churkin). Harding also asserts that the "top level of the Soviet diplomatic service arranged his 1987 Moscow visit. With assistance from the KGB... The spy chief [Vladimir Kryuchkov] wanted KGB staff abroad to recruit more Americans." Harding cited Trump as writing in The Art that the trip included a tour of "a half dozen potential sites for a hotel, including several near Red Square" and that he "was impressed with the ambition of Soviet officials to make a deal". Through January 2019, The Moscow Project—an initiative of the liberal Center for American Progress Action Fund—had documented 101 contacts between sixteen Trump associates and Russia-linked individuals during the Trump campaign or transition. During the 2016 campaign, Trump repeatedly praised Russian president Vladimir Putin as a strong leader, leading to jokes about their "bromance". From various occasions in 2013 to 2015, Trump has said regarding Putin, "I do have a relationship with him", "I met him once", and "I spoke indirectly and directly with President Putin, who could not have been nicer". However, from 2016, during Trump's election campaign, Trump's stance changed. During a press conference Trump claimed, "I never met Putin, I don't know who Putin is ... Never spoken to him", and during another interview Trump said, "I have no relationship with him". Several Trump advisers, including former National Security Advisor Michael Flynn and former campaign manager Paul Manafort, have been connected to Russian officials, or to Viktor Yanukovich and other pro-Russian Ukrainian officials. Russian agents were overheard during the campaign saying they could use Manafort and Flynn to influence Trump. Members of Trump's campaign and later his White House staff, particularly Flynn and Jared Kushner, were in contact with Russian government officials both before and after the November election, including some contacts which they initially did not disclose. As of May 2017[update], the FBI is investigating several alleged links between Trump associates and representatives of the Russian government. British and Dutch intelligence services have given information to their United States counterparts about meetings in European cities between Russian officials, associates of Putin, and associates of then-President-elect Trump. American intelligence agencies also intercepted communications of Russian officials, some of them within the Kremlin, discussing contacts with Trump associates. The Wall Street Journal reported that United States intelligence agencies monitoring Russian espionage found Kremlin officials discussing Trump's associates in the spring of 2015. At the time, U.S. intelligence analysts were reportedly confused, but not alarmed, by these intercepted conversations. In July 2017, the conversations were re-examined in light of a recently disclosed Trump Tower meeting involving Donald Trump Jr. and Russian lawyer Natalia Veselnitskaya. The New York Times reported that multiple Trump associates, including Manafort and other members of his campaign, had repeated contacts with senior Russian intelligence officials during 2016, although officials said that, so far, they do not have evidence that Trump's campaign had cooperated with the Russians to influence the election. Manafort said he did not knowingly meet any Russian intelligence officials. Flynn and now-Attorney General Jeff Sessions subsequently confirmed contacts after having initially denied them. Kremlin spokesman Dmitry Peskov told CNN that the "electoral process" was not discussed during these meetings, and that the Russian ambassador Sergey Kislyak had also met with "people working in think tanks advising Hillary or advising people working for Hillary" during the campaign. 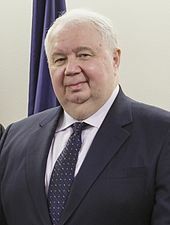 Russian diplomat Sergey Kislyak met with a number of U.S. officials. In particular, Kislyak met with several Trump campaign members, transition team members, and administration nominees. Involved people dismissed those meetings as routine conversations in preparation for assuming the presidency. Trump's team has issued at least twenty denials concerning communications between his campaign and Russian officials; several of these denials turned out to be false. The Trump administration reportedly asked the FBI for help in countering news reports about alleged contacts with Russia. Former ambassadors Michael McFaul and John Beyrle said they were "extremely troubled" by the evidence of Russian interference in the U.S. election. Both supported an independent investigation into the matter, but dismissed as "preposterous" the allegations that Kislyak participated in it, particularly through his meetings with the Trump campaign: "Kislyak's job is to meet with government officials and campaign people," McFaul stated. "People should meet with the Russian Ambassador and it's wrong to criminalize that or discourage it." According to three officials who reviewed a letter sent to The Washington Post in December 2016, a meeting took place in Trump Tower on December 1 or 2 between Kushner, Kislyak, and Flynn. In the meeting, Kushner is alleged to have requested that a direct Russian-encrypted communications channel be set up to allow secret communication with Russia which would circumvent safeguards in place by the United States intelligence community. The goal would be to allow Flynn to speak directly to Russian military officials about Syria and other issues. No such communications channel was actually set up, according to the sources. After the meeting, Kislyak sent a report of the meeting to the Kremlin using what he thought were secure channels, but it was intercepted by American intelligence. Kislyak was reportedly taken aback by the request and expressed concern of the security implications that would be at stake in having an American use secure communications between the Kremlin and diplomatic outposts. Former Acting CIA Director Michael Morell stated in March 2017 that he had seen no evidence of collusion between Trump and the Kremlin. "On the question of the Trump campaign conspiring with the Russians here, there is smoke, but there is no fire, at all," Morell said. In a March 2017 interview, James Clapper, the Director of National Intelligence under President Obama, said that at the time of the intelligence community's report on the issue in January 2017, there was no evidence of any collusion between the Trump campaign and Russian operatives. Former FBI Director James Comey, who was dismissed from his position in May 2017, subsequently testified under oath as follows: "In one conversation, Trump suggested that if there were some 'satellite' associates of his who did something wrong, it would be good to find that out." David A. Graham, staff writer at The Atlantic, has written: "It's no wonder Trump is upset about the dossier, but his mantra that 'there was no collusion [and] everybody including the Dems knows there was no collusion' rings false these days. While there's not yet any public evidence to indicate a crime was committed, or that Trump was involved, it is clear that the Trump campaign and later transition were eager to work with Russia, and to keep that secret." Special Counsel Robert Mueller submitted his report to the Justice Department after 22 months of investigation on March 22, 2019. Mueller concluded his investigation in March 2019 and his report was summarized by Attorney General William Barr in conjunction with Deputy Attorney General Rod Rosenstein. In Barr's summary of the Mueller report to Senate Judiciary Committee and House Judiciary Committee chairs and ranking members, Barr explained that Mueller "did not find that the Trump campaign or anyone associated with it conspired or coordinated with Russia to influence the 2016 U.S. presidential election." In December 2015, Michael Flynn was paid $45,000 by Russia Today, a Kremlin-supported television channel, for delivering a talk in Moscow, and Russia provided him a three-day, all-expenses-paid trip. As a retired military intelligence officer, Flynn was required to obtain prior permission from the Defense Department and the State Department before receiving any monies from foreign governments; Flynn apparently did not seek that approval before the RT speech. Two months later, in February 2016 when he was applying for renewal of his security clearance, he stated he had received no income from foreign companies and had only "insubstantial contact" with foreign nationals. Glenn A. Fine, the acting Defense Department Inspector General, confirmed he is investigating Flynn. On November 10, 2016, President Obama warned President-elect Trump against hiring Flynn. Trump appointed Flynn as National Security Advisor on November 18, 2016, but Flynn was forced to resign on February 13, 2017, after it was revealed that on December 29, 2016, the day Obama announced sanctions against Russia, Flynn discussed the sanctions by phone with Russian ambassador Sergey Kislyak. Flynn had earlier acknowledged speaking to Kislyak but denied discussing the sanctions. On March 2, 2017, The New York Times reported that Flynn and Kushner met with Kislyak in December 2016 to establish a line of communication between the Trump administration and the Russian government. In May 2017, it was further reported that at that December meeting, Kushner and Flynn asked the Russians to set up a direct, encrypted communications channel with Moscow, so that Flynn could speak directly to Russian military officials about Syria and other matters without the knowledge of American intelligence agencies. Kislyak was hesitant to allow Americans access to Russia's secure communications network, and no such channel was actually set up. 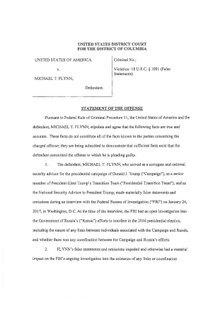 On May 31, 2017, the House Intelligence Committee served Flynn with subpoenas for testimony and production of personal documents and business records. On September 13, The Wall Street Journal reported that Flynn promoted a multibillion-dollar Middle Eastern Russian-backed nuclear plant project while working in the White House. The project involved building 40 nuclear reactors across the Middle East, with security provided by Rosoboron, a Russian state-owned arms exporter that is under American sanctions. On September 15, BuzzFeed reported that Flynn, Kushner, and Bannon secretly met with King Abdullah II of Jordan on January 5, 2017, to press for the nuclear power plant project. On December 1, 2017, Flynn pleaded guilty to lying to the FBI, and is yet to be sentenced. The special counsel is investigating Kushner's finances, as well as his meetings with Russian banker Sergey Gorkov and Russian ambassador Sergey Kislyak. In April 2017, it was reported that Donald Trump's son-in-law and senior advisor, Jared Kushner, on his application for top secret security clearance, failed to disclose numerous meetings with foreign officials, including Russian Ambassador Sergey Kislyak as well as Sergey Gorkov, the head of the Russian state-owned bank Vnesheconombank. Kushner's lawyers called the omissions "an error". Vnesheconombank said the meeting was business-related, in connection with Kushner's management of Kushner Companies. However, the Trump administration provided a different explanation, saying it was a diplomatic meeting. According to U.S. officials, investigators believe that Kushner has important information regarding the FBI investigation. In mid-December 2016, when Trump "was openly feuding with American intelligence agencies," Kushner met for thirty minutes with Russian banker Sergey N. Gorkov, "whose financial institution was deeply intertwined with Russian intelligence" and is "under sanction by the United States". By late May 2017, the meeting had "come under increasing scrutiny" by the Senate Intelligence Committee, as "current and former American officials" said "it may have been part of an effort by Mr. Kushner to establish a direct line to Mr. Putin outside established diplomatic channels". As reported in the Paradise Papers, Secretary of Commerce Wilbur Ross uses offshore investments to own a stake in Navigator, a shipping company with contracts with the Russian gas company Sibur. Co-owners of Sibur have ties to Vladimir Putin and are under U.S. sanctions. Anthony Scaramucci, a Trump campaign member who was appointed White House Communications Director in July 2017, discussed joint investments between his firm and a sanctioned Russian government fund. Scaramucci met with Kirill Dmitriev, head of the Russian Direct Investment Fund, a $10 billion state investment vehicle under U.S. government sanctions. Scaramucci confirmed the meeting took place, saying he had "long known" Dmitriev, and criticized American sanctions as ineffective. In June 2017, CNN published a story about an alleged congressional investigation into Scaramucci's relationship with the fund. However, the story was quickly retracted as "not solid enough to publish as-is," causing three CNN employees to resign. In March 2017, it was revealed that while still a U.S. 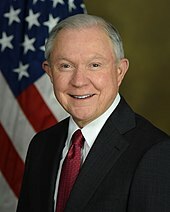 Senator, Attorney General Jeff Sessions, an early and prominent supporter of Trump's campaign, spoke twice with Russian ambassador Kislyak before the election – once in July 2016 and once in September 2016. At his January 10 confirmation hearing to become Attorney General, he stated he was not aware of any contacts between the Trump campaign and the Russian government, adding that he "did not have communications with the Russians". On March 1, 2017, he stated his answer had not been misleading, indicating that he "never met with any Russian officials to discuss issues of the campaign". On March 2, 2017, after meeting with senior career officials at the Justice Department, Sessions announced that he would recuse himself from any investigations into Russia's interference in the 2016 presidential election. In such investigations, Deputy Attorney General Rod Rosenstein has served as the Acting Attorney General. On January 23, 2018, The New York Times reported that Sessions had been interviewed by Mueller's team the previous week. Former ExxonMobil CEO Rex Tillerson, who was appointed Secretary of State by President Trump, has close ties to Russia and Vladimir Putin. He managed the Russia account of ExxonMobil, and was appointed Exxon CEO in 2006 largely on the strength of his Russian relationships. In 2011, Tillerson struck a major deal with Russia and its state-owned oil company Rosneft, giving ExxonMobil access to oil resources in the Russian Arctic. In recognition, Tillerson was awarded the Russian Order of Friendship, Russia's highest decoration for foreign citizens. Tillerson has known Putin since his work in Russia during the 1990s, and according to John Hamre, "he has had more interactive time with Vladimir Putin than probably any other American with the exception of Henry Kissinger". Tillerson was United States Secretary of State from February 1, 2017, to March 31, 2018. Republican public relations and media consultant Michael R. Caputo worked for Gazprom in Russia, and later as an adviser on the Trump campaign. Caputo lived in Russia from 1994 to 2000, employed by Gazprom-Media, and at the end of that period he contracted with Gazprom to do public relations work oriented toward raising Vladimir Putin's support level in the U.S. He returned to the U.S. where his former mentor Roger Stone convinced him to move to Miami Beach, Florida; there Caputo founded a media advising company. Caputo moved back to Europe in 2007 while advising a politician's campaign for parliament in Ukraine. Caputo worked as the campaign manager for Carl Paladino's 2010 run for Governor of New York state. Caputo was put in charge of the Trump campaign's communications for the New York state Republican primary from approximately November 2015 to April 2016, then left the campaign in the summer of 2016. In an inquiry by the House Intelligence Committee as part of their investigation into Russian interference in the 2016 U.S. presidential election, Caputo denied having ties to the Russian government while working on the Trump campaign. On June 18, 2018, Caputo admitted in a CNN interview that he told the Mueller investigation about his contacts with Henry Greenberg, a Russian claiming to have information about Hillary Clinton, in contrast to what he told the House Intelligence Committee in 2017. Caputo has since modified his testimony to the now closed House Intelligence Committee investigation to reflect his contact with Henry Greenberg. Grand jury indictment against Paul J. Manafort Jr. and Richard W. Gates III, unsealed October 30, 2017. On February 14, 2017, The New York Times reported that Paul Manafort had repeated contacts with senior Russian intelligence officials during 2016. Manafort said he did not knowingly meet any Russian intelligence officials. Intercepted communications during the campaign show that Russian officials believed they could use Manafort to influence Trump. On June 2, 2017, special counsel Robert Mueller assumed the criminal probe into Manafort, which predates the 2016 election and the counterintelligence probe that in July 2016 began investigating possible collusion between Moscow and associates of Trump. Manafort was forced to resign as Trump campaign chairman in August 2016 amid questions over his business dealings in Ukraine years earlier. On September 18, 2017, CNN reported that the FBI wiretapped Manafort from 2014 until an unspecified date in 2016 and again from the fall of 2016 until early 2017, pursuant to two separate Foreign Intelligence Surveillance Act (FISA) court orders. It has not been confirmed that Trump's conversations with Manafort were intercepted as part of this surveillance. CNN also confirmed that "Mueller's team ... has been provided details of these communications." In October 2017, Manafort was indicted by a federal grand jury and arrested on twelve criminal charges including conspiracy, money laundering, failure to register as an agent of a foreign power, and false statements. The charges arose from his consulting work for a pro-Russian government in Ukraine and are unrelated to the Trump campaign. Manafort pleaded not guilty and was placed under house arrest. On February 22, 2018, Manafort was indicted on 32 federal charges including tax evasion, money laundering and fraud relating to their foreign lobbying before, during and after the 2016 campaign. The following day, after Rick Gates plead guilty to some charges, he was indicted on two additional charges relating to pro-Russian lobbying in the United States. On September 14, Manafort entered a plea deal with prosecutors, pleading guilty to a charge of conspiracy against the US and a charge of conspiracy to obstruct justice, while also agreeing to co-operate with the Special Counsel investigation. Mueller's office stated in a November 26, 2018, court filing that while supposedly co-operating Manafort had repeatedly lied about a variety of matters, breaching the terms of his plea agreement. On December 7, 2018, the special counsel's office filed a document with the court listing five areas in which they say Manafort lied to them. In January 2019, Manafort's lawyers submitted a filing to the court in response to this accusation. Through an error in redacting, the document accidentally revealed that while he was campaign chairman, Manafort met with Konstantin Kilimnik, who is believed to be linked to Russian intelligence. The filing says Manafort gave him polling data related to the 2016 campaign and discussed a Ukranian peace plan with him. Rick Gates, a longtime business partner and protege of Paul Manafort, was a senior member of the Trump campaign. He continued to work for Trump after Manafort's resignation and Trump's election as President, but in March 2017 was forced to resign from a pro-Trump lobbying group due to questions about his Russia ties. Gates worked with Manafort to promote Viktor Yanukovych and pro-Russian factions in Ukraine. Russian oligarch Oleg Deripaska was the biggest investor in Davis Manafort, a lobbying and investment firm that employed Gates. In October 2017, Gates was indicted by a federal grand jury and arrested on twelve criminal charges including conspiracy, money laundering, failure to register as an agent of a foreign power, and false statements. The charges arose from his consulting work for the pro-Russian government in Ukraine and are unrelated to the Trump campaign. Gates pleaded not guilty and was placed under house arrest. On February 22, 2018, Gates was indicted on 38 federal charges including tax evasion, money laundering and fraud relating to their foreign lobbying before, during and after the 2016 campaign. The following day, Gates plead guilty to making false statements to the FBI and conspiracy to defraud the United States and agreed to cooperate with Mueller investigation. The second set of indictments were to stand pending Gates' cooperation and assistance in the Mueller investigation. In a March 2016 interview, Trump identified Carter Page, who had previously been an investment banker in Moscow, as a foreign policy adviser to his campaign. Page became a foreign policy advisor to Trump in the summer of 2016. During the investigation into Russian interference in the 2016 U.S. elections, Page's past contacts with Russians came to public attention. In 2013 Page met with Viktor Podobnyy, then a junior attaché at the Permanent Mission of the Russian Federation to the United Nations, at an energy conference, and provided him with documents on the U.S. energy industry. Page later said he provided only "basic immaterial information and publicly available research documents" to Podobnyy. Podobnyy was later one of a group of three Russian men charged by U.S. authorities for participation in a Russian spy ring; Podobnyy and one of the other men was protected by diplomatic immunity from prosecution; a third man, who was spying for the Russia under non-diplomatic cover, pleaded guilty to conspiring to act as an unregistered foreign agent and was sentenced to prison. The men had attempted to recruit Page to work for the Russian SVR. The FBI interviewed Page in 2013 "as part of an investigation into the spy ring, but decided that he had not known the man was a spy", and never accused Page of wrongdoing. Page was dropped from the Trump team after reports that he was under investigation by federal authorities over his Russian connections. The FBI and the Justice Department obtained a FISA warrant to monitor Page's communications during October 2016, after they made the case that there was probable cause to think Page was acting as an agent of a foreign power (Russia). Page told The Washington Post that he considered that to be "unjustified, politically motivated government surveillance". According to the Nunes memo, the 90-day warrant was renewed three times. In February 2017, Page stated he had "no meetings" with Russian officials during 2016, but two days later said he "did not deny" meeting with Russian Ambassador Sergey Kislyak during the 2016 Republican National Convention in Cleveland. Page's revised account occurred after news reports that revealed that Attorney General Jeff Sessions had likewise met with Kislyak. In March 2017, Page was called on by the Senate Intelligence Committee investigating links between the Trump campaign and Russian government. On March 9, 2017, Hope Hicks, a Trump spokesperson, distanced the campaign from Page, stating that Page was an "informal foreign policy adviser" who did "not speak for Mr. Trump or the campaign." In September 2017, Page filed a defamation lawsuit against the media company Oath Inc. for its outlets' reporting of his alleged meetings with Russian officials. The suit was dismissed in March 2018 for lacking factual accusations of defamation. George Papadopolous, of Chicago, Illinois, pleaded guilty on October 5, 2017, to making false statements to FBI agents, in violation of 18 U.S.C. 1001. The case was unsealed on October 30, 2017. In March 2016, George Papadopoulos, a foreign policy adviser on the Trump campaign, sent an email to seven campaign officials with the subject line "Meeting with Russian Leadership - Including Putin", offering to set up "a meeting between us and the Russian leadership to discuss US-Russia ties under President Trump". Trump campaign advisers Sam Clovis and Charles Kubic objected to this proposed meeting. In May 2016, Ivan Timofeev, an official for the Russian International Affairs Council, emailed Papadopoulos about setting up a meeting with Trump and Russian officials in Moscow. Papadopoulos forwarded the email to Paul Manafort, who responded, "We need someone to communicate that [Trump] is not doing these trips." Papadopoulos was arrested in July 2017 and has since been cooperating with Special Counsel Robert Mueller's investigation. In October 2017 he pleaded guilty to a single charge of making a false statement to FBI investigators. The guilty plea was part of a plea bargain in which he agreed to cooperate with the government and "provide information regarding any and all matters as to which the Government deems relevant." Following this, Papadopoulos was sentenced to 14 days in prison, 12 months supervised release, 200 hours of community service and was fined $9,500, on September 7, 2018. Roger Stone, a former adviser to Donald Trump and self-proclaimed political "dirty trickster", said in March 2017 that during August 2016, he had been in contact with Guccifer 2.0, a hacker persona who publicly claimed responsibility for at least one hack of the DNC, believed to be operated by Russian intelligence. In a 2019 filing, prosecutors claimed Stone communicated with Wikileaks, and sought details about the scope of information stolen from the Democratic Party. Just prior to the election, the Clinton campaign accused Stone of having prior knowledge of the hacks, after he wrote, "Trust me, it will soon [sic] the Podesta's time in the barrel" on Twitter shortly before Wikileaks released the Podesta emails. Stone claimed he was actually referring to reports of the Podesta Group's own ties to Russia. In his opening statement before the United States House Permanent Select Committee on Intelligence on September 26, 2017, Stone reiterated this explanation, saying, "Note that my tweet of August 21, 2016, makes no mention whatsoever of Mr. Podesta's email, but does accurately predict that the Podesta brothers' business activities in Russia ... would come under public scrutiny." Stone has reportedly stated privately to some Republican colleagues that he has "actually communicated with Julian Assange" on at least one occasion, although Stone and his two attorneys have since denied this. Instead, Stone has "clarified ... that the two have a mutual journalist friend," who Stone ultimately named as Randy Credico. Stone awaits trial on charged of witness tampering, obstructing an official proceeding, and five counts of making false statements. Stone pleaded not guilty and denied wrongdoing in press interviews. In May 2016, Donald Trump Jr. met with Aleksandr Torshin and Maria Butina at a N.R.A.-sponsored dinner. Both Torshin and Butina worked to broker a secret meeting between then-candidate Trump and Russian president Putin. On June 9, 2016, Trump campaign chairman Donald Trump Jr., Jared Kushner and Paul Manafort had a meeting with Russian lawyer Natalia Veselnitskaya after being promised information about Hillary Clinton. Trump Jr. told The New York Times the meeting was about the Magnitsky Act. However, in emails proposing the meeting, publicist Rob Goldstone did not mention the Magnitsky Act and instead promised "documents and information that would incriminate Hillary" as "part of Russia and its government's support for Mr. Trump", to which Donald Trump Jr. responded, "if it's what you say I love it". On October 9, 2017, CNN reported that Scott S. Balber, formerly a lawyer for Donald Trump and now the billionaire Agalarov's[who?] lawyer, obtained a memo from Veselnitskaya which showed that her focus at the meeting was repealing the Magnitsky Act sanctions, "not providing damaging information on Clinton". Subsequently, Foreign Policy published the full memo she took to the meeting. On May 30, 2017, as inquiries into alleged Russian meddling in the U.S. election expanded, both the House and Senate congressional panels asked President Donald Trump's personal lawyer Michael Cohen, who is one of Trump's closest confidants, to "provide information and testimony" about any communications he had with people connected to the Kremlin. On May 31, 2017, the House Intelligence Committee served Cohen with subpoenas for testimony and production of personal documents and business records. On June 1, 2017, The Guardian reported that Nigel Farage, former leader of the United Kingdom Independence Party and one of the first non-American political figures to meet Trump following the election, was a person of interest in the FBI investigation, which Farage denied. Farage had previously met the Russian Ambassador to the United Kingdom Alexander Yakovenko, Roger Stone and Julian Assange, and The Guardian's source was quoted as saying, "If you triangulate Russia, WikiLeaks, Assange and Trump associates, the person who comes up with the most hits is Nigel Farage". Andrei Nikolaev, son of Russian billionaire businessman Konstantin Nikolaev who financially supported Maria Butina from 2012 to 2014, is a Trump supporter that volunteered at the Trump Campaign headquarters and was in the Washington D.C. Trump International Hotel during Trump's inauguration in January 2017. On April 3, 2017, The Washington Post reported that around January 11, 2017, nine days before Donald Trump's inauguration, Erik Prince, founder of the Blackwater security company, secretly met with an unidentified Russian who is close to Vladimir Putin, in the Seychelles. The Trump administration said it was "not aware of any meetings" and said that Prince was not involved in the Trump transition. According to U.S., European, and Arab officials, the meeting was arranged by the United Arab Emirates (UAE) and the purpose apparently was to establish a back-channel link between Trump and Putin. The UAE and Trump's associates reportedly tried to convince Russia to limit its support to Iran, including in Syria. Prince also appeared to have close ties to Trump's chief strategist Stephen Bannon. The Seychelles meeting took place after previous meetings in New York between Trump associates and officials from Russia and the Emirates, while official contacts between the Trump administration and Russian agents were coming under close scrutiny from the press and the U.S. intelligence community. U.S. officials said the FBI is investigating the Seychelles meeting; the FBI, however, refused to comment. Two intelligence officials confirmed to NBC News that the Seychelles meeting took place. One of them corroborated The Washington Post's account, but said it is not clear whether the initiative to arrange a meeting came from the UAE or Trump's associates and that no Trump transition people were directly involved. A second official said that the meeting was about "Middle East policy, to cover Yemen, Syria, Iraq and Iran", not Russia. Prince's spokesperson said, "Erik had no role on the transition team, this is a complete fabrication. The meeting had nothing to do with President Trump. Why is the so-called under-resourced intelligence community messing around with surveillance of American citizens when they should be hunting terrorists?" A senior Trump administration official called the story of a Trump-Putin back-channel "ridiculous." The New York Times reported on May 19, 2018, that Donald Trump Jr. met with intermediary George Nader, Erik Prince and Joel Zamel in Trump Tower on August 3, 2016. Nader reportedly told Trump Jr. the crown princes of Saudi Arabia and the UAE were eager to help his father win the election, and Zamel pitched a social media manipulation campaign. Trump Jr. reportedly responded favorably and Nader subsequently had frequent meetings with Steve Bannon, Michael Flynn and Jared Kushner. The Times reported that Prince had arranged the August 2016 meeting; Prince had stated in his November 30, 2017, testimony to the House Intelligence Committee that he had no formal communications or contact, nor any unofficial role, with the Trump campaign. In a May 2017 interview with the Wall Street Journal, Peter W. Smith, with a long history of Republican donation and support, said he had set up an operation to try to obtain emails he believed had been deleted from Hillary Clinton's computer server, from Russian hackers. He claimed to be working on behalf of Trump campaign advisor Michael Flynn. In ill health, days later, the 81-year-old Smith committed suicide. On October 31, 2016, a week before the election, David Corn of Mother Jones magazine reported that an unnamed former intelligence officer had produced a report (later referred to as a dossier) based on Russian sources and had turned it over to the FBI. The officer, who was familiar to the FBI and was known for the quality of his past work, was later identified as Christopher Steele. The FBI found Steele and his information credible enough that it considered paying Steele to continue collecting information, but the release of the document to the public stopped discussions between Steele and the FBI. Corn said the main points in the unverified report were that Moscow had tried to cultivate Donald Trump for years, that it possessed compromising or potentially embarrassing material about him that could possibly be used to blackmail him, and that there had been a flow of information between the Trump campaign and the Kremlin which involved multiple in-person meetings between Russian government officials and individuals working for Trump. The dossier also claimed that the Kremlin's goal had been to "encourage splits and divisions in the Western alliance". On January 10, 2017, CNN reported that classified documents presented to Obama and Trump the previous week included allegations that Russian operatives possessed "compromising personal and financial information" about Trump. CNN stated it would not publish specific details on the memos because they had not yet "independently corroborated the specific allegations". Following CNN's report, BuzzFeed then published a 35-page dossier that it said was the basis of the briefing. The document included unverified claims that Russian operatives had worked with the Trump campaign to help him get elected, and also alleged that Russia had collected "embarrassing material" involving Trump that could be used to blackmail him. Trump denounced the unverified claims as false, saying it was "disgraceful" for U.S. intelligence agencies to report on them. On March 30, 2017, Paul Wood of BBC News revealed that the FBI was using the dossier as a roadmap for its investigation. On April 18, 2017, CNN reported that corroborated information from the dossier had been used as part of the basis for renewing a FISA warrant to continue monitoring former Trump foreign policy advisor Carter Page in October 2016. 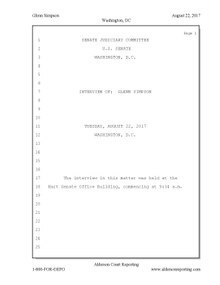 On January 9, 2018, the ranking member of the Senate Judiciary Committee, Dianne Feinstein, unilaterally released the transcript of Fusion GPS' Glenn R. Simpson from August 22, 2017. ^ a b "Clinton Ally Michael Morell says no evidence of Trump-Russia collusion". NBC News. Retrieved March 16, 2017. ^ a b "Full Clapper: "No Evidence" of Collusion Between Trump and Russia". NBC News. March 5, 2017. Retrieved March 20, 2017. ^ Schwartz, Ian (May 19, 2017). "Feinstein: No Evidence Of Russian Collusion With Trump Campaign, But There Are Rumors". Real Clear Politics. Retrieved May 30, 2017. ^ Savage, Charlie (July 11, 2017). "Donald Trump Jr. and Russia: What the Law Says". The New York Times. Retrieved July 12, 2017. ^ Borger, Julian; Ackerman, Spencer (March 20, 2017). "Trump-Russia collusion is being investigated by FBI, Comey confirms". The Guardian. ^ Levine, Mike; Kelsey, Adam (May 17, 2017). "Robert Mueller appointed special counsel to oversee probe into Russia's interference in 2016 election". ABC News. Retrieved May 17, 2017. ^ Carney, Jordain (January 24, 2017). "Senate committee moving forward with Russia hacking probe". The Hill. Retrieved March 4, 2017. ^ a b c Mark Mazzetti; Matthew Rosenberg (May 23, 2017). "Michael Flynn Misled Pentagon About Russia Ties, Letter Says". The New York Times. p. A1. Retrieved May 24, 2017. ^ Singman, Brooke (October 30, 2017). "Paul Manafort, Rick Gates indicted by federal grand jury in Russia probe". Fox News Channel. Retrieved October 30, 2017. ^ "Trump Campaign Aides Had Repeated Contacts With Russian Intelligence". February 14, 2017. Retrieved May 4, 2018 – via NYTimes.com. ^ CNN, Pamela Brown, Evan Perez, Shimon Prokupecz and Jim Sciutto,. "US officials: Info suggests Trump associates may have coordinated with Russians". Retrieved May 4, 2018. ^ CNN, Evan Perez, Shimon Prokupecz and Pamela Brown,. "US government wiretapped Trump campaign chair". Retrieved May 4, 2018. ^ "Mueller Has Dozens of Inquiries for Trump in Broad Quest on Russia Ties and Obstruction". April 30, 2018. Retrieved May 4, 2018 – via NYTimes.com. ^ a b "Letter". Scribd. Retrieved 2019-03-24. ^ a b Kimball, Jacob Pramuk, Spencer (2019-03-24). "Trump did not collude with Russia, says Mueller, and is cleared of obstruction by the attorney general". www.cnbc.com. Retrieved 2019-03-24. ^ McCarthy, Tom (December 13, 2016). "Trump's relationship with Russia – what we know and what comes next". The Guardian. Retrieved March 11, 2017. ^ Bump, Philip (March 3, 2017). "The web of relationships between Team Trump and Russia". The Washington Post. Retrieved March 11, 2017. ^ a b c d e Harding, Luke (November 19, 2017). "The Hidden History of Trump's First Trip to Moscow". Politico. Retrieved November 19, 2017. ^ "Trump's Russia Cover-Up By the Numbers – 101 contacts with Russia-linked operatives". The Moscow Project. August 7, 2018. ^ Viebeck, Elise; Markon, Jerry; DeYoung, Karen (November 14, 2016). "Trump, Putin agree in phone call to improve 'unsatisfactory' relations between their countries, Kremlin says". The Washington Post. Retrieved March 14, 2017. ^ Conradi, Peter (January 13, 2017). "Trump and Putin's Bromance Could Change the World". GQ. Retrieved May 29, 2017. ^ Colvin, Jill. "Have Trump and Putin met before? It depends when you asked". Associated Press. Retrieved March 3, 2018. ^ Nesbit, Jeff. "Donald Trump's Many, Many, Many, Many Ties to Russia". Time. Retrieved February 28, 2017. ^ Olearchyk, Roman (August 28, 2016). "Ukraine's Leaders Campaign against 'Pro-Putin' Trump". Financial Times. London. The prospect of Mr Trump ... becoming leader of the country's biggest ally has spurred not just Mr Leshchenko but Kiev's wider political leadership to do something they would never have attempted before: intervene, however indirectly, in a US election. ^ Williams, Katie Bo (May 24, 2017). "NYT: Russians discussed using Manafort, Flynn to influence Trump". The Hill. Retrieved May 28, 2017. ^ Mazzetti, Michael S. Schmidt, Mark; Apuzzo, Matt (February 14, 2017). "Trump Campaign Aides Had Repeated Contacts With Russian Intelligence". The New York Times. ^ Parker, Ned; Landay, Jonathan; Strobel, Warren (May 18, 2017). "Exclusive: Trump campaign had at least 18 undisclosed contacts with Russians: sources". Reuters. Retrieved May 19, 2017. ^ Collinson, Stephen (March 20, 2017). "Comey confirms FBI investigating Russia, Trump ties". CNN. ^ a b Rosenberg, Matthew; Goldman, Adam; Schmidt, Michael S. (March 2, 2017). "Obama Administration Rushed to Preserve Intelligence of Russian Election Hacking". The New York Times. p. A1. ^ Harris, Shane (July 12, 2017). "Russian Officials Overheard Discussing Trump Associates Before Campaign Began". The Wall Street Journal. Retrieved July 13, 2017. ^ Mindock, Clark (July 12, 2017). "US intelligence 'overheard Russian officials mention meetings with Trump associates in 2015'". The Independent. Retrieved July 13, 2017. ^ a b Schmidt, Michael S.; Mazzetti, Mark; Apuzzo, Matt (February 14, 2017). "Trump Campaign Aides Had Repeated Contacts With Russian Intelligence". The New York Times. Retrieved March 2, 2017. ^ Balluck, Kyle (March 12, 2017). "Kremlin spokesman: Russian ambassador met with advisers to Clinton campaign too". The Hill. Retrieved March 13, 2017. ^ "Trump team issued at least 20 denials of contacts with Russia". USA Today. Retrieved March 13, 2017. ^ "A Who's Who of the Trump Campaign's Russia Connections". Rolling Stone. Retrieved March 13, 2017. ^ Sommer, Will (March 11, 2017). "Diplomats warn of Russia hysteria". The Hill. Retrieved March 13, 2017. ^ Haberman, Maggie (March 21, 2017). "Roger Stone, the 'Trickster' on Trump's Side, Is Under F.B.I. Scrutiny". The New York Times. Retrieved April 18, 2017. ^ a b c "Russian ambassador told Moscow that Kushner wanted secret communications channel with Kremlin". The Washington Post. Retrieved May 27, 2017. ^ a b Mazzetti, Mark; Apuzzo, Matt; Haberman, Maggie (May 26, 2017). "Kushner Is Said to Have Discussed a Secret Channel to Talk to Russia". The New York Times. Retrieved May 27, 2017. ^ Bartash, Jeffry. "Comey's juicy Trump account leaves some big questions unanswered", Marketwatch (June 8, 2017). ^ LaFraniere, Sharon; Benner, Katie (2019-03-22). "Mueller Delivers Report on Trump-Russia Investigation to Attorney General". The New York Times. Retrieved 2019-03-24. ^ Huetteman, Emmarie; Rosenberg, Matthew (April 27, 2017). "Pentagon Inquiry Seeks to Learn if Flynn Hid Foreign Payment". The New York Times. Retrieved June 1, 2017. ^ Day, Chad; Braun, Stephen (May 22, 2017). "Flynn rejects Trump-Russia probe subpoena; Dems say he lied". ABC News. Retrieved June 1, 2017. ^ Dovere, Edward-Isaac; Nussbaum, Matthew (May 8, 2017). "Obama warned Trump about Flynn, officials say". Politico. Retrieved May 24, 2017. ^ Shear, Michael D. (May 8, 2017). "Obama Warned Trump About Hiring Flynn, Officials Say". The New York Times. Retrieved May 24, 2017. ^ Dilanian, Ken (February 10, 2017). "Official: Flynn Discussed Sanctions With Russians Before Taking Office". NBC News. Retrieved March 2, 2017. ^ Murray, Sara; Borger, Gloria; Diamond, Jeremy (February 14, 2017). "Flynn resigns amid controversy over Russia contacts". CNN. Retrieved March 2, 2017. ^ Michael S. Schmidt; Matthew Rosenberg; Matt Apuzzo (March 2, 2017). "Kushner and Flynn Met With Russian Envoy in December, White House Says". The New York Times. Retrieved March 3, 2017. ^ a b Williams, Katie Bo (May 31, 2017). "Seven subpoenas issued in House Russia probe". TheHill. Retrieved June 1, 2017. ^ a b CNN, Tom LoBianco, Jeremy Herb and Deirdre Walsh,. "House intelligence panel subpoenas Flynn, Cohen; seeks 'unmasking' docs". Retrieved May 4, 2018. ^ Stewart, Christopher S.; Barry, Rob; Harris, Shane (September 13, 2017). "Flynn Promoted Nuclear-Plant Project While in White House". The Wall Street Journal. ISSN 0099-9660. Retrieved September 14, 2017. ^ "Michael Flynn accused of promoting nuclear power project in Middle East while he worked at White House". The Telegraph. ^ "Trump Advisers Secretly Met With Jordan's King While One Was Pushing A Huge Nuclear Power Deal". BuzzFeed. Retrieved September 16, 2017. ^ "Former national security adviser Michael Flynn pleads guilty to lying to FBI in Russia probe". December 2, 2017. Retrieved February 6, 2017. ^ Horwitz, Sari; Zapotosky, Matt; Entous, Adam (June 15, 2017). "Special counsel is investigating Jared Kushner's business dealings". The Washington Post. ^ Filipov, David; Brittain, Amy; Helderman, Rosalind S.; Hamburger, Tom (June 1, 2017). "Explanations for Kushner's meeting with head of Kremlin-linked bank don't match up". The Washington Post. ^ Dilanian, Ken; Alexander, Peter; Kube, Courtney (May 26, 2017). "Jared Kushner Under Scrutiny in Russia Probe, Officials Say". NBC News. ^ Rosenberg, Matthew; Mazzetti, Mark; Haberman, Maggie (May 29, 2017). "Investigation Turns to Kushner's Motives in Meeting With a Putin Ally". The New York Times. Retrieved May 30, 2017. ^ Wilkinson, Tracy (2017-11-06). "Commerce secretary's financial ties to Putin allies draw scrutiny". Los Angeles Times. ISSN 0458-3035. Retrieved 2017-11-07. ^ Arkhipov, Ilya; Donahue, Patrick (January 17, 2017). "Trump Aide Talks Investment With Sanctioned Kremlin Fund". Bloomberg L.P. Retrieved July 29, 2017. ^ Stelter, Brian (June 26, 2017). "CNN employees resign after retracted article". CNNMoney. Retrieved July 29, 2017. ^ Entous, Adam; Nakashima, Ellen; Miller, Greg (March 1, 2017). "Sessions met with Russian envoy twice last year, encounters he later did not disclose". The Washington Post. Retrieved March 2, 2017. ^ Lichtblau, Eric; Shear, Michael D.; Savage, Charlie; Apuzzo, Matt; Haberman, Maggie; Schmidt, Michael S. (March 2, 2017). "Jeff Sessions Recuses Himself From Russia Inquiry". The New York Times. ^ Schmidt, Michael S. (2018-01-23). "Sessions Is Interviewed in Mueller's Russia Investigation". New York Times. Retrieved 2018-01-23. ^ "Mueller's team interviews Sessions in Russia probe". Politico. Retrieved 2018-01-23. ^ Olson, Bradley (December 6, 2016). "Rex Tillerson, a Candidate for Secretary of State, Has Ties to Vladimir Putin". The Wall Street Journal. Retrieved July 13, 2017. ^ Ormiston, Susan (April 11, 2017). "Will Tillerson's Russian medal of honour pay dividends now?". CBC News. Retrieved July 13, 2017. ^ Egan, Matt; Horowitz, Julia; Isidore, Chris (December 11, 2016). "Behind the deep ties between Exxon's Rex Tillerson and Russia". CNNMoney. Retrieved July 13, 2017. ^ CNN, Maegan Vazquez, Sarah Westwood and Boris Sanchez,. "Former Trump operative Roger Stone met with Russian who wanted $2M for Clinton dirt". CNN. Retrieved 2018-06-20. ^ Rosenberg, Matthew; Goldman, Adam; Apuzzo, Matt (May 24, 2017). "Top Russian Officials Discussed How to Influence Trump Aides Last Summer". The New York Times. Retrieved May 30, 2017. ^ a b Savage, Charlie (October 30, 2017). "What It Means: The Indictment of Manafort and Gates". The New York Times. Retrieved October 30, 2017. ^ a b Harris, Andrew M. (October 30, 2017). "Manafort, Gates Placed Under House Arrest After Not Guilty Pleas". Bloomberg. Retrieved October 30, 2017. ^ a b "New indictment hits Paul Manafort and Rick Gates with tax and bank fraud charges". NBC News. February 22, 2018. Retrieved February 24, 2018. ^ "New indictment accuses Manafort of paying European politicians" (February 23, 2018). CNN. Retrieved February 24, 2018. ^ "Ex-Trump Campaign Aide Manafort To Cooperate With Russia Probe, In Mueller investigation". Headlines Today. Retrieved 15 September 2018. ^ "Manafort Breached Plea Deal by Repeatedly Lying, Mueller Says". Retrieved November 27, 2018. ^ Polantz, Katelyn; Cohen, Marshall (December 8, 2018). "Mueller: Paul Manafort lied about contacts with Trump administration this year". CNN. Retrieved 8 December 2018. ^ Polantz, Katelyn (January 8, 2019). "Mueller believes Manafort fed information to Russian with intel ties". CNN. Retrieved 9 January 2019. ^ Confessore, Nicholas; Meier, Barry (June 16, 2017). "How the Russia Investigation Entangled a Manafort Protégé". The New York Times. Retrieved July 13, 2017. ^ Hamburger, Tom (March 22, 2017). "Manafort is gone, but his business associate remains a key part of Trump's operation". The Washington Post. Retrieved July 13, 2017. ^ Landers, Elizabeth; Diamond, Jeremy (March 23, 2017). "Gates out at nonprofit over Manafort-Russia ties". CNN. Retrieved July 13, 2017. ^ "Former Trump campaign official Rick Gates pleads guilty to 2 charges". Washington Post. February 23, 2018. Retrieved February 24, 2018. ^ a b Nakashima, Ellen; Devlin Barrett; Adam Entous (April 11, 2017). "FBI obtained FISA warrant to monitor former Trump adviser Carter Page". The Washington Post. Retrieved April 11, 2017. ^ a b c d Adam Goldman, "Russian Spies Tried to Recruit Carter Page Before He Advised Trump", The New York Times (April 4, 2017). ^ Julie Pace (April 3, 2017). "Trump campaign adviser Carter Page met with Russian spy in 2013". Chicago Tribune. Associated Press. ^ Ali Watkins, "A Former Trump Adviser Met With A Russian Spy", BuzzFeed News (April 3, 2017). ^ Julie Pace (March 6, 2017). "Senate committee calls on former Trump adviser Carter Page in Russia investigation". Associated Press. ^ Bertrand, Natasha (March 9, 2017). "Foreign policy adviser disavowed by Trump team says he 'spent many hours' at Trump campaign headquarters". Business Insider. Retrieved April 12, 2017. ^ Brennan, Christopher. "Carter Page sues media over reports tying him to Russia". Daily News. New York. Retrieved September 18, 2017. ^ Lafond, Nicole; Kirkland, Allegra (March 21, 2018). "Judge Tosses Carter Page Defamation Suit Against Yahoo Parent Company". Talking Points Memo. Retrieved January 15, 2019. ^ Guild, Blair (August 14, 2017). "Trump adviser emails show attempts to set up Russia meeting, report says". CBS News. Retrieved August 15, 2017. ^ Apuzzo, Matt; Schmidt, Michael S. (October 30, 2017). "Trump Campaign Adviser Met With Russian to Discuss 'Dirt' on Clinton". New York Times. ^ Bump, Phillip (October 30, 2017). "Paul Manafort: A FAQ about Trump's indicted former campaign chairman". Washington Post. Retrieved October 30, 2017. ^ "Ex-Trump Adviser George Papadopoulos Pleads Guilty in Mueller's Russia Probe". NBC News. October 30, 2017. Retrieved October 30, 2017. ^ "Ex-Trump Aide Papadopoulos Sentenced To 14 Days Jail For Lying To FBI". Headlines Today. Retrieved 8 September 2018. ^ Matishak, Martin (March 20, 2017). "Roger Stone takes center stage as Congress lines up Russia probe witnesses". Politico. Retrieved April 18, 2017. ^ "Special counsel prosecutors say they have communications of Stone with WikiLeaks". ^ Danner, Chas. "Trump Adviser Roger Stone Admits Messaging With Alleged DNC Hacker". New York. Retrieved April 23, 2017. ^ a b Farley, Robert (March 28, 2017). "Misrepresenting Stone's Prescience". FactCheck.org. Retrieved July 13, 2017. ^ Bertrand, Natasha (September 26, 2017). "Top Trump confidant points to dubious report to justify conversation with Russian cyber spy". Business Insider. Retrieved October 18, 2017. ^ Massie, Chris; McDermott, Nathan; Kaczynski, Andrew. "Trump adviser Roger Stone repeatedly claimed to know of forthcoming WikiLeaks dumps". CNN. Retrieved April 23, 2017. ^ Raju, Manu; Herb, Jeremy (2017-11-29). "New York radio personality was Roger Stone's WikiLeaks contact". CNN. Retrieved 2017-11-30. ^ Kocieniewski, David. "Trump Associate Stone Charged With Obstruction in Mueller Probe". www.bloomberg.com. Retrieved January 25, 2019. ^ "Roger Stone Arrested on Obstruction Charges in Mueller Investigation". Time. Retrieved January 25, 2019. ^ CNN, Katelyn Polantz. "Roger Stone enters not guilty plea". CNN. ^ "Mariia Butina, Who Sought 'Back Channel' Meeting for Trump and Putin, Is Charged as Russian Agent". The New York Times. ^ Becker, Jo; Apuzzo, Matt; Goldman, Adam (July 9, 2017). "Trump's Son Met With Russian Lawyer After Being Promised Damaging Information on Clinton". The New York Times. Retrieved July 11, 2017. ^ "Read the Emails on Donald Trump Jr.'s Russia Meeting". The New York Times. July 11, 2017. Retrieved July 12, 2017. ^ Apuzzo, Matt; Becker, Jo; Goldman, Adam; Haberman, Maggie. "Trump Jr. Was Told in Email of Russian Effort to Aid Campaign". The New York Times. Retrieved July 11, 2017. ^ Brown, Pamela; Herb, Jeremy (October 9, 2017). "Russians' lawyer says new documents show Trump Tower meeting not about dirt on Clinton". CNN. Retrieved October 17, 2017. ^ a b Ross, Brian; Mosk, Matthew (May 30, 2017). "Congress expands Russia investigation to include Trump's personal attorney". ABC News. Retrieved May 30, 2017. ^ Kirchgaessner, Stephanie; Hopkins, Nick; Harding, Luke (June 1, 2017). "Nigel Farage is 'person of interest' in FBI investigation into Trump and Russia". The Guardian. Retrieved June 2, 2017. ^ Helderman, Rosalind S. (July 22, 2018). "Russian billionaire with U.S. investments backed alleged agent Maria Butina, according to a person familiar with her Senate testimony". Washington Post. Retrieved October 27, 2018. ^ Watkins, Eli; Herb, Jeremy (July 22, 2018). "Alleged spy told Senate panel about backing from Russian billionaire". CNN. Retrieved October 27, 2018. ^ "Константин Николаев - марионетка Игоря Левитина" [Konstantin Nikolaev - Igor Levitin's puppet]. RosPres.com (in Russian). July 26, 2018. Retrieved October 27, 2018. ^ CNN, Jeremy Herb, Katelyn Polantz, Liz Stark and Manu Raju. "Democrats grilled Prince about meeting Bannon". CNN. ^ Adam Entous, Greg Miller, Kevin Sieff & Karen DeYoung, "Blackwater founder held secret Seychelles meeting to establish Trump-Putin back channel", The Washington Post (April 3, 2016). ^ a b Dilanian, Ken; Arkin, William M. (April 3, 2017). "Blackwater Founder Repped Trump at Secret Meeting Overseas: Sources". NBC News. Retrieved April 19, 2017. ^ "Trump Jr. and Other Aides Met With Gulf Emissary Offering Help to Win Election". May 19, 2018. Retrieved May 19, 2018 – via NYTimes.com. ^ Harris, Shane (June 29, 2017). "GOP Operative Sought Clinton Emails From Hackers, Implied a Connection to Flynn". The Wall Street Journal. Retrieved July 3, 2017. ^ Cohn, Alicia (June 29, 2017). "GOP investigation sought connection between Clinton's emails and Russia: report". The Hill. Retrieved July 3, 2017. ^ Borger, Julian (June 30, 2017). "Russia hackers discussed getting Clinton emails to Michael Flynn – report". The Guardian. Retrieved July 3, 2017. ^ Lighty, Katherine Skiba, David Heinzmann, Todd. "Peter W. Smith, GOP operative who sought Clinton's emails from Russian hackers, committed suicide, records show". Retrieved May 4, 2018. ^ Hamburger, Tom; Helderman, Rosalind S. (February 28, 2017). "FBI once planned to pay former British spy who authored controversial Trump dossier". The Washington Post. Retrieved March 1, 2017. ^ Gray, Rosie (January 10, 2017). "It Is Fake News Meant to Malign Mr. Trump". The Atlantic. Retrieved January 12, 2017. ^ Shane, Scott (January 11, 2017). "What We Know and Don't Know About the Trump-Russia Dossier". The New York Times. Retrieved January 12, 2017. ^ Perez, Evan; Sciutto, Jim; Tapper, Jake; Bernstein, Carl (January 10, 2017). "Intel chiefs presented Trump with claims of Russian efforts to compromise him". CNN. Retrieved January 11, 2017. ^ Wemple, Eric (January 10, 2017). "BuzzFeed's ridiculous rationale for publishing the Trump-Russia dossier". The Washington Post. Retrieved January 11, 2017. ^ Mak, Tim; Suebsaeng, Asawin; Weiss, Michael (January 11, 2017). "U.S. Spies Warn Trump and GOP: Russia Could Get You Next". The Daily Beast. Retrieved January 11, 2017. ^ Sutton, Kelsey (January 11, 2017). "Trump calls CNN 'fake news,' as channel defends its reporting on intelligence briefing". Politico. Retrieved March 17, 2017. ^ Rascoe, Ayesha (January 11, 2017). "Trump accuses U.S. spy agencies of Nazi practices over 'phony' Russia dossier". Reuters. Retrieved March 17, 2017. ^ Bertrand, Natasha (March 30, 2017). "The FBI is reportedly using the explosive Trump-Russia dossier as a 'roadmap' for its investigation". Business Insider. Retrieved April 19, 2017. ^ Perez, Evan; Prokupecz, Shimon; Raju, Manu (April 18, 2017). "FBI used dossier allegations to bolster Trump-Russia investigation". CNN. Retrieved April 19, 2017. ^ Barrett, Devlin; Hamburger, Tom (2018-01-09). "Fusion GPS founder told Senate investigators the FBI had a whistleblower in Trump's network". Washington Post. ISSN 0190-8286. Retrieved 2018-01-09. Andrew Weisburd; Clint Watts; JM Berger (November 6, 2016). "Trolling for Trump: How Russia is Trying to Destroy Our Democracy". War on the Rocks. Strohm, Chris (December 1, 2016). "Russia Weaponized Social Media in U.S. Election, FireEye Says". Bloomberg News. Demirjian, Karoun (December 8, 2016). "Republicans ready to launch wide-ranging probe of Russia, despite Trump's stance". Chicago Tribune. Porter, Tom (December 1, 2016). "US House of representatives backs proposal to counter global Russian subversion". International Business Times UK edition. Hettena, Seth (May 2018). Trump / Russia: A Definitive History. Melville House. ISBN 978-1612197395. Wikimedia Commons has media related to Russian interference in 2016 United States elections.